DUROSTAT A2 provides a potential for high hardness and therefore high levels of resistance to mechanical wear. This steel is used for components subjected to high mechanical wear and abrasion: loading and transport equipment, excavator parts, machine components for road construction, preparation, crushing, silos. 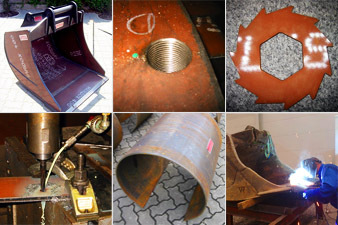 The technical terms of delivery apply for plate thicknesses from 8 - 100 mm. DUROSTAT A2 steels are produced via the LD-route. The plates are delivered in as-rolled condition (hot-rolled, untreated), since usually heat treatment such as quenching or tempering is carried out on the finished parts. The heat analysis is provided as proof of the chemical composition. Unless otherwise agreed, tolerances according to EN 10029 (thickness tolerance according to class A, flatness tolerance according to class N) and surface finish according to EN 10163- A1 are valid.